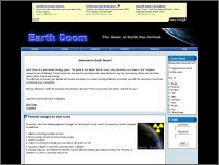 Earth Doom is a web based strategy game. The game is tick based, that is, every sixty seconds or so, when a "tick" happens, resources are distributed. These resources are used to purchase units, base defences, spy on your enemy, attack and purchase power plants to generate energy. You will need to provide your people with homes and keep your mines working efficiently to provide you with the necessary resources to eliminate your competition.